Understanding how forests responded to past changes in the Earth’s climate has been a long-standing area of research, but in recent years there has also been growing interest in anticipating how modern climate change may lead to shifts in tree species abundance and distribution . Of course, climate is just one of many factors that determine why trees grow where they grow, including soils, competition, land-use history, and synergistic relationships with other species, e.g. seed dispersers. Partly as a result of this complexity, there is a lot of uncertainty in the results of vegetation models that estimate future habitat suitability or distribution of tree species. Two things we can say for sure are that (1) tree species will respond independently to changing conditions, so we may see novel species associations and forest types in some locations in the future and (2) there will be significant time lags in forest response (see box, right). In this bulletin, we briefly review several modeling efforts and how they compare, as well as highlighting potential limitations and best practices for utilizing the results. The vegetation models used to assess potential tree species shifts can be broadly sorted into two categories on either end of a spectrum, from empirical (i.e. statistical) to process-based (i.e. mechanistic) models. Empirical models quantify statistical relationships between species occurrence data, such as plot data from the US Forest Service Forest Inventory and Analysis (FIA), and relevant environmental variables, such as soils and climate, then use those correlations to project into the future. These are often referred to as species distribution models, niche models or bioclimatic envelope models. Example: DISTRIB, the core model used in development of the Climate Change Tree Atlas (see table below), uses a statistical approach known as regression tree analysis to define the ecological niche of a species based on (1) a series of climate, soil, elevation, and landuse predictor variables and (2) data from FIA about the relative abundance of a species in the overstory. More specifically, it utilizes a relatively new ensemble data-mining technique called Random Forests, which has some improvements that are designed to avoid “overfitting” the data. For more detail on the technique read this paper by Prasad et al 2006. Based on these results, the model has been used to map where the habitat (in terms of climate conditions, soil characteristics, etc.) is suitable for a particular species now and in the year 2100. This tells us something about how likely a species is to persist in particular area. Note: In the future, the Climate Change Tree Atlas will use DISTRIB in conjunction with a simulation model called SHIFT to go beyond predictions of future suitable habitat and estimate actual species movement in terms of the likelihood of colonization. Process-based models are generally more complex because they simulate the actual underlying processes, such as disturbance, growth, and regeneration. Forest gap models, ecosystem models, forest landscape models, and dynamic global vegetation models (DGVMs) fall under this category. Example: LANDIS PRO is a spatially explicit forest landscape model that simulates processes at the species- (e.g. growth, seedling establishment, mortality), stand- (e.g. competition, stand development), and landscape-scale (e.g. disturbance from fire, insects, harvest, etc.). By “growing” the forests in this way, LANDIS can be used to compare species in the future under a climate change and no climate change scenario. This tells us something about how likely a species is to become established in a particular area. For more detailed information on this topic, we recommend visiting the Landscape Analysis section of the US Forest Service Climate Change Resource Center website. Table 1 in this paper by Littell et al (2011) also has a useful comparison of the strengths and weaknesses of different types of empirical and process models, for reference. The table below compares several modeling efforts that estimate changes in habitat suitability or distribution for U.S. tree species under future climate change. Model names are hyperlinks that take you to the project website where you can view results, including maps (in some cases), for different species. This table is intended to help forest managers quickly navigate to existing projections of species shift and weigh the merits and characteristics of each approach. Comparing the results from different models reveals whether they generally agree (lending greater confidence) or disagree on the outlook for particular species. 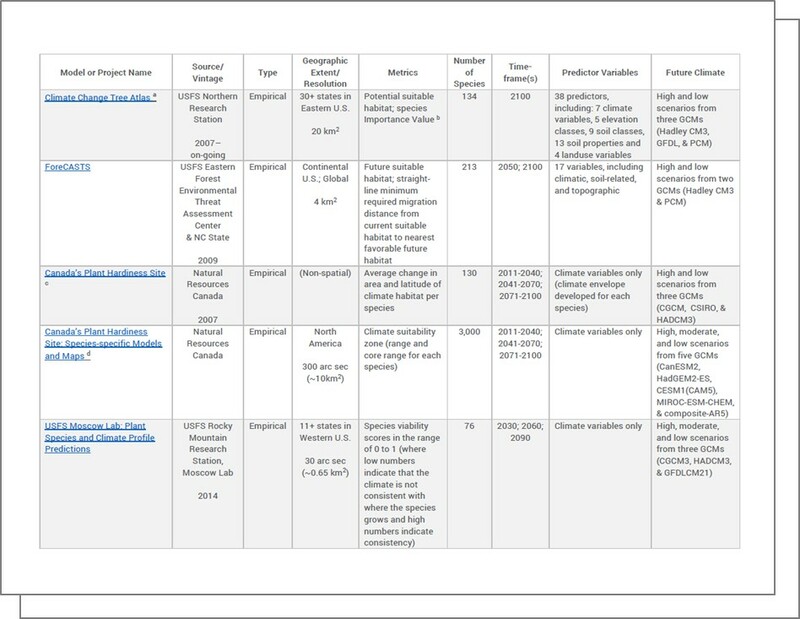 Some of this work is being carried out by the US Forest Service through their on-going series of Vulnerability Assessments (see final row in the table below) and the CSLN will alert Network members to similar comparative efforts as they arise. Remember there will be significant time lags. Consider projections for individual species, rather than forest types. Use more than one type of model (wherever possible) to assess likely vegetation shifts1—we can have greater confidence where different models agree. Use MODFACs, a decision support framework that scores adaptability for different tree species, in conjunction with models to determine whether a species is likely to fare better or worse than modeled projections. Mistake maps of habitat suitability for depictions of where a tree species will actually be growing at that point in the future. Use model projections as exact predictions of what will happen with future forest shifts. As we noted in a previous bulletin, there are some limitations associated with modeling efforts that rely on statistical relationships between environmental variables and current species distributions derived from FIA data (i.e. the realized niche), since that represents only a portion of the possible conditions under which a species could grow (i.e. the fundamental niche). 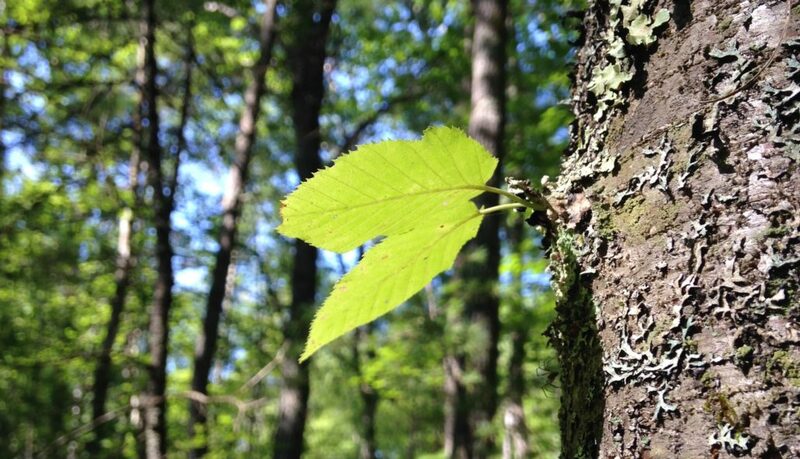 Revisit part of our July 2015 bulletin on uncertainty and forest response for a brief explanation of how the absence of data on the fundamental niche can lead to underestimating the potential adaptability of some tree species. This is not to say that forests aren’t vulnerable in other ways, such as increasing damage from exotic pests and extreme weather, but they may be more adaptable in terms of temperature tolerance than some results suggest. As an initial step, we recommend CSLN members spend a little time perusing the results of the modeling efforts listed above, to get a sense for the general outlook for species that dominate their economic or management concerns. Noting where (and if) the models agree can highlight potential areas of vulnerability (or opportunity) to be explored further. Members who have an interest in digging-in on projections for a particular species, can contact the CSLN staff for additional assistance. All the modeling efforts agree on at least one thing—conditions are going to change. Most tree species will begin to experience novel climate conditions in some portion of their range and, in some cases, that may lead to local extirpation. Ultimately, the uncertainty is in knowing exactly where and when these species distribution shifts will happen. Generally, we expect species range expansion at the leading edge, in northern and higher elevations, and range contraction at the trailing edge, in southern and low-altitudinal limits. In particular, look for initial forest composition changes at range margins because it is regeneration success or failure there that will determine whether a species persists or migrates. Adams, H.D., Williams, A.P., Chonggang, X., Rauscher, S.A., Jiang, X., McDowell, N.G. 2013. Empirical and process-based approaches to climate-induced forest mortality models. Frontiers in Plant Science. 4 (438):5pp. Littell, J.S., McKenzie, D., Kerns, B.K., Cushman, S., Shaw, C.G. 2011. Managing uncertainty in climate-driven ecological models to inform adaptation to climate change. Ecosphere. 2(9): 102. Loarie, S.R., Duffy, P.B., Hamilton, H., Asner, G.P., Field, C.B., Ackerly, D.D. 2009. The velocity of climate change. Nature. 462:1052-1055. Pearson, R.G. 2006. 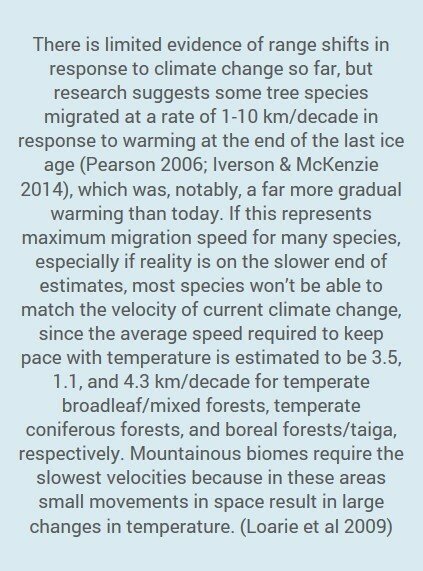 Climate change and the migration capacity of species. Trends in Ecology and Evolution. 21(3):111-113. Climate Change & Wildlife Impacts: Part 2 Carbon Markets and Forests: What Does the Future Hold?